An artist's rendition of the Mars lander Phoenix traveling through space, just before unfurling its solar cells. NASA?sMars-bound Phoenix spacecraft is gearing up for a landmark landing near themartian north pole this month to find out whether the region could have oncesupported microbial life. Phoenix is oncourse for a planned May 25 touchdownin the martian arctic that, if successful, will mark the first poweredlanding on Mars since NASA?s hefty Viking 2 lander set down in 1976. 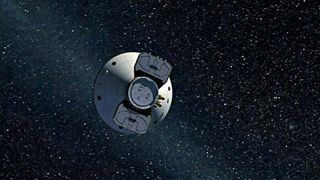 But first,the probe is expected to fire its thrusters several times in the next fewweeks to fine-tune its flight path. ?It?s scaryhow smooth it?s been,? said Barry Goldstein, Phoenix project manager at NASA?sJet Propulsion Laboratory (JPL) in Pasadena, Calif. ?The vehicle has just beenbehaving beautifully.? The Phoenixlander tweakedits course in early April and is scheduled to fire its thrusters in threesuccessive Saturday maneuvers beginning May 10. The spacecraft has flown soaccurately that one of the maneuvers may not be necessary, Goldstein said. Launched inAugust 2007, Phoenix is a stationary lander equipped with a trench-diggingrobotic arm to bite into the martian surface and scoop up samples of nearby soiland water ice. The probe?s top-mounted suite of ovens and wet chemistryinstruments are designed to help determine whether its arctic plain landingsite - a region similar in latitude to central Greenland or northern Alaska onEarth - could have once proven habitablefor primitive life. ?We?relooking for all the ingredients for life,? Phoenix deputy principleinvestigator Deborah Bass of JPL told SPACE.com. Phoenixalso includes a martian atmosphere-monitoring station designed to provide dailyweather updates during the probe?s planned three-month mission. Engineers atJPL will oversee the spacecraft?s initial Mars descent and landing beforetransferring operations to a control center at the University of Arizona,Tucson, for the remainder of the $420 million mission. ?This is anarea of Mars that I have spent my career studying and I cannot wait to seethose first images,? Bass said. ?To see that ice, what that frozen tundra isgoing to look like...whatever we see will be amazing because no one?s seen itbefore.? Unlike themost recent probes to land on Mars - NASA?s twin rovers Spirit and Opportunity and the lostBritish lander Beagle 2 - Phoenix will not use airbags to cushion its arrivalon the martian surface. Instead, it carries a set of rocket thrusters controlits final descent, though its approach will mark the first powered landingattempt since NASA?s MarsPolar Lander crashed near the planet?s south pole in December 1999. ?I havealways trumpeted the fact that we should be very guarded and very humble in ourapproach with what we?re trying to do, because it is so difficult,? Goldsteinsaid, adding that engineers have identified and addressed as many of the risksas possible. Phoenix?sscience team, led by principle investigator Peter Smith at the University ofArizona, Tucson, has been eagerly preparing for the lander?s Mars arrival witha series of training simulations for landing day and mission operations. Themost recent simulation, a dress rehearsal for Phoenix?s entry and descentthrough the martian atmosphere, was scheduled for Tuesday. ?At thispoint, we feel we?re in good shape and we want to do it. We?re ready,? Basssaid. ?This team is itching to get its hands on this stuff?it?s show time. ?